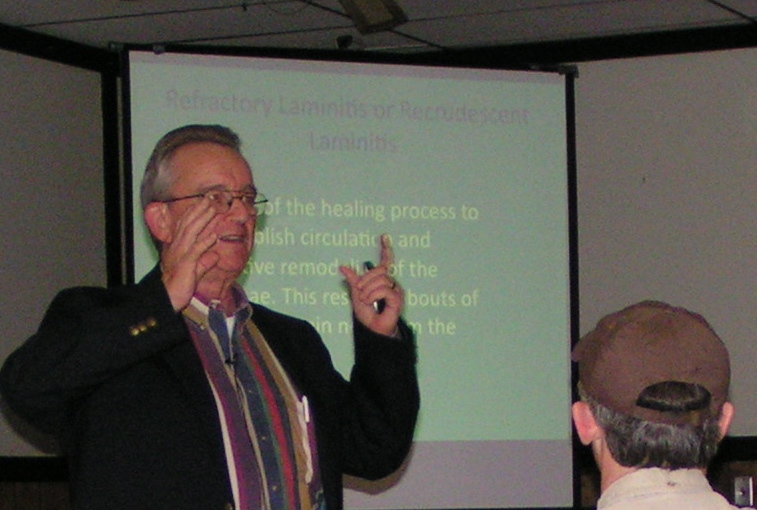 Dr. Don Walsh, president of the Animal Health Foundation, gave Natural Hoof Care professionals an important point to be aware of regarding laminitis and its prevention. Dr. Donald Walsh, AHF President, during his presentation at the Liberated Horsemanship Clinic in April. The presentation entitled “You, the hoof care giver, are the first line of defense in preventing laminitis” was heard by attendees of the Liberated Horsemanship Clinic held April 16, 2011 in Warrenton, MO, sponsored by Dr. Bruce Nock, PhD. Dr. Walsh pointed out that the person caring for the horse’s feet is in a position to see and recognize the first signs of laminitis, before any lameness may be apparent. Changes occur in the hoof during the early stage of the disease that can be recognized by the observant hoof care professional, who can then alert the horse owner of these warning signs. Changes that may be observed include abnormal growth rings in the external hoof wall which are wider at the heel, a separation in the sole of the foot in the toe between the external hoof wall and the white line (seedy toe), and often small hemorrhages are seen in this area due to the stretching of the laminae prior to a bout of laminitis. Veterinary care should be started as soon as possible, for the longer that damage takes place within the laminae of the foot, the less likely recovery is possible. The sooner the laminitic process can be halted, the better the chances are for reversing the effects of the disease. The first line of defense in preventing laminitis can be the horse’s hoof care professional. Early detection of changes in the hoof may save the horse’s life.